Many of our patients’ families will care for their loved ones for varying periods of time both before patients receive Hospice care and during. Therefore, here at Woodlands, we recognise the need to support our patients’ families - as well as the patient themselves - through what is a difficult and emotional period. There is a dedicated Family Support Service at the Hospice that focuses on the varying support needs of patient families, including coping with grief, financial concerns and many other emotional issues. We also run a Hospice at Home Service for patients who are registered with a South Sefton GP. Those eligible and referred to the service by a Healthcare Professional (such as a District Nurse) can receive specialist end of life care in their home, to enhance a care package that is already in place. The Hospice at Home Service provides support for up to 4 hours during either a morning or afternoon, or overnight visits from 10pm-7am to assist in bridging the gap between care already being received. 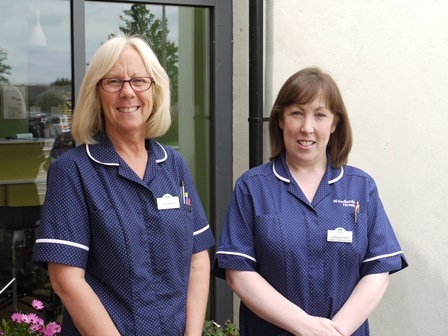 Hospice at Home Co-ordinators, Carol Mitchell and Catherine Gavin commented on how, despite the service’s main focus being to provide specialist end of life care and support for their patients, there can often be additional benefits to their carers and families. Carol and Catherine said, “Family members can use the time that Health Care Assistants are with a patient to take some time for themselves to rest, shop or get some practical jobs done. We also provide educational support as, often, the care levels patients require can change significantly towards the end of their lives, which can leave their carers facing a steep learning curve. We can help lay the foundation for carers to continue providing the right level of care and ease some of the fears they may face, such as when is the right time to call a District Nurse or use of equipment safely.